Democratic Sen. Elizabeth Warren and Republican Sen. Cory Gardner unveiled legislation Thursday that would fully protect state-legal marijuana programs as well as resolve banking and taxation issues dogging the MJ industry. The measure – which faces uphill odds before November’s midterm elections – also would legalize industrial hemp nationwide. 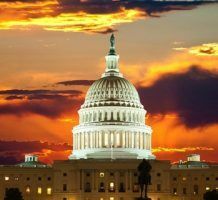 The Strengthening the Tenth Amendment Through Entrusting States Act, or STATES Act, aims to resolve the current conflict between states with legal cannabis programs and federal law that classifies marijuana as illegal. Gardner, from Colorado, said he talked with President Trump on Thursday and the president remains supportive of the states’ rights concept. Protect state-legal cannabis programs by exempting them from federal drug laws. Allow individual states to decide whether to make marijuana legal. Permit MJ businesses in state-legal programs to take ordinary tax deductions. They currently can’t do so. Allow MJ businesses to put money in federally insured banks; all transactions and proceeds in state-legal programs would be considered lawful. Remove industrial hemp from the list of controlled substances. A House version is being introduced by Reps. Jared Polis, D-Colorado, David Joyce, R-Ohio, and Earl Blumenauer, D-Oregon. Previous legislation has dealt with the issues confronting the marijuana industry in more of a piecemeal fashion. He has no relation to his namesake/soulmate Jeff Sessions. Pete will have to fight for his seat in this upcoming midterm election, polls are showing Texans supporting legalization by as much as 83%. States that have Legal Medical Cannabis programs need to Allow patients to Grow their Own Cannabis if they choose to do so.. Most disabled people (like myself) can NOT afford to pay for the prescription, So, for many people the program is a dead end street..
Insurance companies need to accept cannabis as a medicine and pay for the Doctor Ordered Prescriptions and/or ALLOW people to Grow Their Own Indoors if necessary..
It’s No Good If you Can’t Afford Your Prescription! John you are so correct sir. This whole Experiment is just that. We gotta get this right and we gotta help so many of us who need relief from excruciating pain. The Price TAG(s) may become simply non-affordable thus creating an even stronger and flourishing Black Market. Just let us Consume the product at a fair price and allow us to grow few plants so we can live our lives modestly yet with dignity! Please…. How does this effect the product CBD as the Farm Bill is removing cannabidiol from the definition of Hemp as of last night? embryonic state bursts forth onto the scene. I’m on that train, I have my ticket, and I’m excited about the destination. “ALL ABOARD”!!!!!! !